Can the U.S. and ASEAN find common ground on the South China Sea? The element of signaling surrounding the first U.S.-ASEAN summit in Sunnylands, California was strong. The White House decision to host ASEAN leaders at the same venue where U.S. President Barack Obama previously received Chinese president Xi Jinping symbolized the increasingly pivotal role the U.S. was according ASEAN as an institution. Visiting Laos and Cambodia, U.S. Secretary of State John Kerry laid some of the groundwork for the Sunnylands summit. With Laos as ASEAN chair this year, many observers worry about a repeat of ASEAN’s failure in 2012, under Cambodia’s chairmanship, to agree to a communiqué on the disputes surrounding the South China Sea. Kerry’s consultations were thus important to encourage Laos and Cambodia to show unity in response to China’s growing assertiveness in the region. This is an important prerequisite to pushing for effective implementation of the Declaration of Conduct and early conclusion the Code of Conduct in the South China Sea. The recent freedom of navigation operation on January 30, during which the guided-missile destroyer USS Curtis Wilbur sailed within 12 nautical miles of Triton Island in the Paracels, controlled by China but also claimed by Vietnam, also highlighted the U.S. efforts to build momentum. While China reacted with predictable outrage, Vietnam expressed its support for the right of innocent passage through its territorial waters in accordance with international law. Although it is unlikely that the summit will produce any definitive statements, for the U.S. this meeting is important in two senses. First, the unprecedented summit reflects Obama’s personal belief in the importance of engaging Southeast Asia countries via overarching rule-based regional institutions in order to balance its bilateral engagement with allies. Second, it is an opportunity to convey to a domestic audience the rising relevance of Southeast Asia, a message that needs to be delivered if U.S. engagement in the region is to be sustained under Obama’s successor. The summit is set to discuss a broad range of issues, from maritime security cooperation to technological entrepreneurship. Right now, however, all eyes are on the decision that the International Tribunal for the Law of the Sea (ITLOS) is scheduled to hand down this March over the status of maritime features in the South China Sea dispute, a flashpoint involving China and five ASEAN members, through which half the world’s trade passes. Not surprisingly, then, this issue is expected to top the agenda during the meeting as U.S. and ASEAN leaders explore ways to respond to the growing tensions in the region. With almost no convergence of views between China and the Philippines (or other players) on the arbitration case, the decision on the seven submissions the Philippines submitted in 2013 is likely to usher in a new normal. The tribunal has no intention of resolving the overlapping claims in their entirety, but it will provide a decision on two main issues: the validity of China’s nine-dashed line claim and the maritime status of the claimed areas, such as whether Taiping/Itu Aba is a rock or an island, and thus whether it can generate Exclusive Economic Zone (EEZ)/Continental Shelf status. Although the extent of conflicts and tensions may depend on the actual ruling by the judges, Asia-Pacific countries are acutely aware that the judgment will set the tone and language that will be used on this issue. Although doing business in Southeast Asia is important to its domestic agenda – to be a moderately well-off society by 2049 – Beijing is likely to adopt a policy of ignoring legal battles altogether. Bureaucratic politics constrain China’s foreign policy mandarins from taking more conciliatory positions. Nonetheless, at a time when China is attempting to reach out to ASEAN to promote its Maritime Silk Road and Asian Infrastructure and Investment Bank initiatives, Beijing will find it hard to strike a balance between economic engagement with ASEAN and maintaining its stance on the South China Sea disputes. The ITLOS decision may therefore provide an opportunity for the creation of a Code of Conduct in the South China Sea. The tribunal decision will also likely have repercussions for the ability of ASEAN members to unite in addressing the issue. This could further erode the credibility of ASEAN centrality, a concept that requires members to be united, given that full consensus is needed to achieve any result under the various ASEAN mechanisms. The majority of ASEAN members wish to maximize trade and investment ties with Beijing while maintaining a close security relationship with Washington. However, members countries have a range of positions when it comes to the Sino-U.S. rivalry. These positions can be broadly placed into one of three groups. Most of the claimants, but most notably the Philippines and Vietnam, have been highly critical of China. The Philippines has elected to renew the Enhanced Defense Cooperation Agreement with the U.S., despite domestic criticism on the question of sovereignty and expanding content. This decision was motivated by anxiety at China’s growing assertiveness in the South China Sea. As for Vietnam, although an alliance remains out of reach given resistance from hardline elements, relations with the U.S. are increasingly warm, and China is a factor in this. A second group of ASEAN members, notably Indonesia, Singapore, and Thailand, have been very keen to maintain strategic autonomy. Nevertheless, with a massive influx of Chinese investment, countries such as Indonesia that are in dire need of infrastructure have been struggling to preserve their neutrality. After work started on Indonesia’s first ever high-speed rail link, a controversial Chinese project that will connect Jakarta and Bandung, Indonesia announced another megaproject that will be led by a Chinese state-owned electricity company. Although the Indonesian government has attempted to preserve its neutrality, for instance declining Beijing’s invitation to conduct military drills in the South China Sea late last year, the country is clearly drawing closer to China. The third group includes Cambodia, Myanmar, and Laos (CML), all countries determined to avoid any position that puts them directly at odds with China. Many observers concluded that Cambodia’s failure in 2012 to agree on a communiqué owed to its decision not to corner its most important economic partner. The gaps between these already divergent positions are only likely to widen after ITLOS announces its decision, with a new round of friction likely. This will motivate claimants to step up their efforts to reassert their claims and to bolster security ties with external powers, especially the U.S. and Japan. Claimants such as Vietnam, depending on the outcome of the Philippines’ case, may start their own legal processes. Members will also pressure various ASEAN meetings to address the challenges that China’s claims present. This will put the non-claimants in the difficult position of having to choose between their fellow ASEAN members and China. The U.S.-ASEAN meeting suggests that relations between the two are warm. 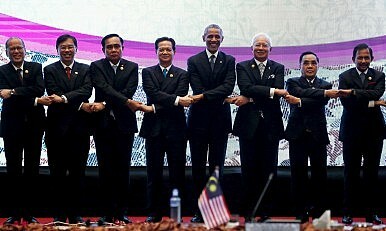 Nonetheless, there is reason to question whether U.S. support for ASEAN centrality will outlive Obama’s administration. Many worry that the next U.S. leader will be focused on domestic issues, or on the deteriorating situation in the Middle East. The diversity of political systems and attitudes towards human rights in ASEAN are another impediment for the U.S. government, which is often seen by its domestic constituents as too soft towards the non-democratic members of ASEAN. Still, Southeast Asia is certainly attracting the attention of other regional powers, such as Japan, India, China, South Korea, and Australia. Whether it is India’s Act East policy or Australia’s “More Jakarta, Less Geneva,” recent moves have signified the rising importance of the region. And in terms of the U.S. rebalance, Southeast Asia is a vital avenue for engaging China. China’s race to modernize its navy to support its territorial claims in the South China Sea poses an imminent challenge, not only for the claimants but also for the U.S., which has an interest in preserving freedom of navigation. Creating a meaningful Code of Conduct has become increasingly important. However, with many ASEAN members embroiled in domestic politics, such as the regression to militarism in Thailand, a high-profile corruption case confronting the Malaysian government, and endless political tussles and infighting between oligarchs in Indonesia, ASEAN finds itself leaderless. This makes the U.S. presence imperative to encourage meaningful discussion in the various ASEAN forums. However, the approach must be such that regional middle powers are able to take the lead. This is important to ensure bottom-up centrality in ASEAN. It is also important to allow ASEAN members, and especially the CML, to maintain their strategic autonomy. Indeed, the U.S. plan for deeper bilateral cooperation with the CML is vital for their economic diversification and their ability to develop a more independent foreign policy. Despite the centrality of China in Washington’s Southeast Asia policy, Kerry’s statement in Cambodia has attempted to carefully delineate the importance of ASEAN. Southeast Asia is an important trading and investment partner for the U.S., and there are other critical issues that the U.S. can address with the bloc, such as climate change. Since assuming office, Obama has sought to institutionalize U.S. relations with Southeast Asia countries. The signing of the Treaty of Amity and Cooperation in 2009, for instance, provided an opportunity for the U.S. and Southeast Asia to move substantially closer. Yet many ASEAN members remain cautious about U.S. engagement in the region. Some worry that the U.S.-led Trans-Pacific Partnership (TPP) will challenge the ASEAN-led Regional Comprehensive Economic Partnership. Although the nature of economic arrangements are not necessarily zero-sum, the TPP has certainly diluted the focus of some ASEAN members. Meanwhile, at last year’s ADMM-Plus gathering in Kuala Lumpur, the decision not to issue a joint declaration was driven by the disappointment of the U.S. delegation at the exclusion of mention of the South China Sea disputes. Clearly, U.S. diplomacy will be tested by an increasingly divergent ASEAN, and by the need to preserve ASEAN centrality, which is vital to create a rules-based Asia-Pacific. Emirza Adi Syailendra is a Research Analyst at the Indonesia Programme at the S. Rajaratnam of International Studies (RSIS), Nanyang Technological University (NTU).